We’ve all heard of Silicon Valley where people like Steve Jobs and Steve Wozniak made their fortunes from thinking outside the box. And San Jose, the tenth largest city in the United States, the first town in the Spanish colony of Nueva California, once was known as an agricultural center rather than a high-tech center. But how many have heard of Los Gatos, California? After a recent visit, I’m here to share with you the beauty of this historic town and suggest it as a retreat from the fast-paced lifestyle of Silicon Valley. Los Gatos is located close to San Jose and Saratoga at the base of the Santa Cruz Mountains. The town is noted for its small, pedestrian-friendly European-style downtown, small local boutique shops, upscale restaurants and historic homes. While Los Gatos has expanded and was re-built after the devastating Loma Prieta Earthquake of 1989, the changes are mostly positive. The little town is thriving and is a frequent weekend destination for the young professionals of Silicon Valley. 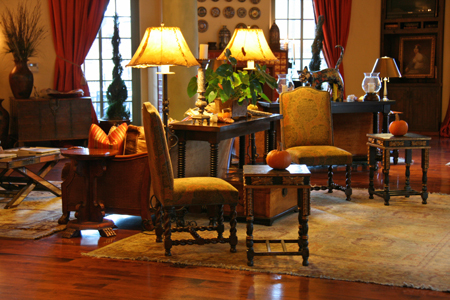 I found that Los Gatos had clearly retained its charm while making some marvelous additions. 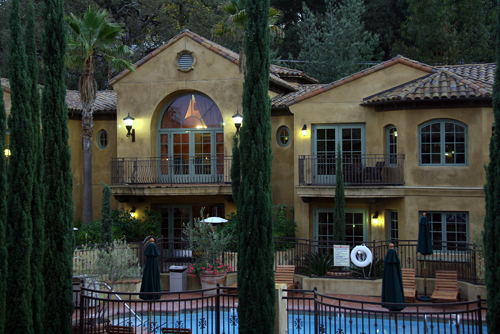 One such addition is the Hotel Los Gatos & Spa, built in an Italian villa style. It is within walking distance of all that Los Gatos is known for. Add in a welcoming spa with European-inspired treatments and a world-class Greek fine dining restaurant and it’s no wonder I felt pampered and cozy during my stay. Hotel Los Gatos is an ideal base for a visit to the Santa Cruz Mountains, to the Silicon Valley or to Central California. The hotel’s spacious rooms and suites, elegant courtyards with outdoor pool and excellent service will make Los Gatos feel like home for a weekend or for a multi-week business stay. The hotel offers 71 finely appointed guestrooms. You’ll enjoy suites and bedrooms. The small touches add to the peaceful comfy feeling of the hotel. You’ll find plush bathrobes, slippers, Egyptian cotton linens and the soft bedding discriminating travelers have come to love. When there is turn-down service you might find some excellent chocolate at your beside. There is high-speed Internet access, large desk, fully stocked honor bar (not outrageously expensive, either) and room service from Dio Deka restaurant. You’ll enjoy a nice sized heated swimming pool and hot tub. The lobby is full of decorations and cushy chairs reminiscent of Italy. The staff have a can-do attitude and will assist the guest in any way they can. The hotel and Dio Deka restaurant have joined forces and serve a buffet style breakfast each morning in the restaurant bar. At breakfast one day, the staff member clued me in to the Sunday Farmer’s Market that would be fun to visit the next morning and offered me a colorful walking map of Los Gatos. Spa Elia, located just downstairs from the lobby, is a full-service spa. It is a small spa with nicely appointed locker rooms, peaceful waiting room and a great selection of spa products. Treatments offered range from a wonderful Signature Mediterranean Massage to body and facial treatments. I enjoyed meeting some of the staff. My massage therapist was both informative and skilled. Using Swedish Massage techniques, she literally dissolved any stress that I might have held in my back due to flying in an ever-more crowded airplane. In fact, I noticed on the spa menu that the spa offers a Vitality Jet Lag Massage… perfect for that Silicon Valley Engineer who is jetting all over the world! This isn’t your average hotel dining room for sure. Separately owned, Restaurant Dio Deka carries along the Mediterranean theme of the property. A very special place, truly reminiscent of upscale European dining, Dio Deka’s owners are on-site, involved with the diners and ensure a quality dining experience. In fact, I forgot the menu and just conferred with the waiter and owner in selecting my meal. I certainly wasn’t sorry I did that. The evenings I was there, the restaurant was filled with positive energy not unlike a popular neighborhood restaurant in Greece. I highly recommend the lamb dishes. Of course Dio Deka is known for excellent steak and seafood as well. A restaurant specialty, and favorite with the customers, is the Keftethakia … Lamb meatballs, blistered grapes Kalamansi yogurt in a light herb broth. And, the best lamb chops I ever experienced were served at Dio Deka… Paithakia … Two double-cut lamb chops, Mesquite-grilled lemon-oregano crusted potatoes, and whipped spinach ($ 37). Yes, the prices are high, but this is truly a fine-dining experience you’ll not forget. Once you’re rested up you may want to venture out (all is within walking distance) to walk along the Los Gatos Creek Trail, shop at the lovely specialty stores or visit the Farmer’s Market (Sunday mornings). 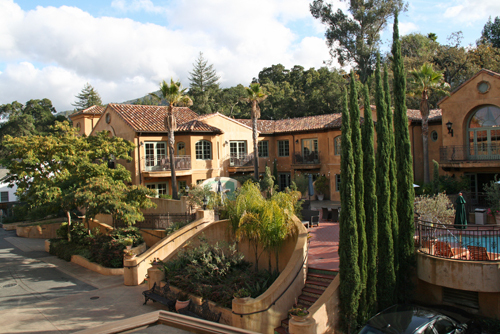 Los Gatos retains a small town charm while giving the visitor a very upscale experience. If you want to explore the back streets of Los Gatos and discover the beautiful historic homes, the South Bay Striders Walking Club offers a free map-guided walk. 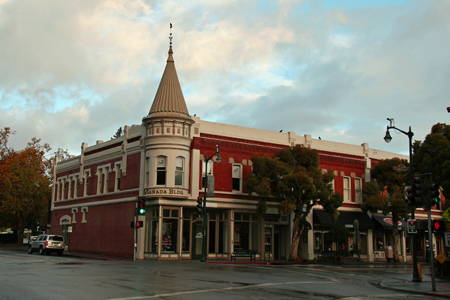 Another nice walking tour of Los Gatos is available through the Chamber of Commerce. I’ll be writing more about Los Gatos and including suggestions of day trips to the Santa Cruz Mountains and San Francisco. But for now, I suggest enjoying the beauty and vibrancy of downtown Los Gatos. Hotel Los Gatos is non-smoking. Parking is free. The hotel is centrally located at: 210 E. Main Street, Los Gatos, CA 95030 which is across the street from the lovely Los Gatos High School and grounds. Surprisingly, the hotel allows pets. I enjoyed seeing several well-behaved large dogs in the lobby while I was there. Sometimes you just have to luxuriate and get fully rested. The Hotel Los Gatos & Spa is ideal for that. One morning I sat on my little balcony and watched the mist drifting down from the mountains. One rainy afternoon I enjoyed the large gas fireplace in the room and watched the rain cleanse the air. Dining at Dio Deka is a must. My friends, who own The French Cellar in Los Gatos and who travel frequently to Europe, told me it was the best in town. I agree! Whether you live and work in Silicon Valley or are planning to travel from afar for a great vacation, I would highly recommend The Hotel Los Gatos. There is so much to see and do in the area but you might just find yourself wanting to laze around the hotel to decompress from your busy life.